HORN PLAYERS AOIFE PARR (THIRD YEAR) AND PETER LE TISSIER (UPPER SIXTH) MADE THEIR DEBUTS AT THE BARBICAN IN THE EASTER HOLIDAYS PLAYING WITH THE THAMES YOUTH ORCHESTRA. 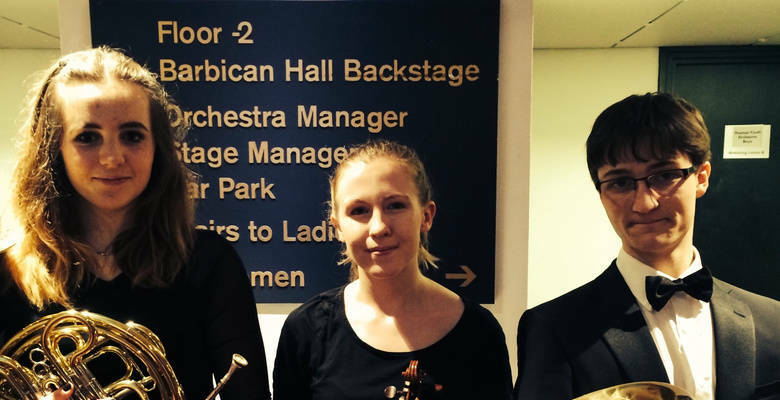 t the start of the Easter holidays, on Sunday 29 March, Third Year pupil Aoife Parr and Upper-Sixth Former Peter Le Tissier, both horn players, made their débuts at the Barbican. They were taking part in the Thames Youth Orchestra’s Tenth Anniversary Concert and the work performed was Mahler’s 90 minute long Second Symphony (for Choir and Orchestra) , otherwise known as the ‘Resurrection Symphony’ – no mean feat for an U18s youth orchestra! Formed in 2005, TYO currently has students from over 25 schools in South West London and has become renowned for its varied and challenging programming. For the Orchestra’s Anniversary Concert, musicians from throughout its ten years were also invited back and these included KGS alumnae, Kath Roberts (2014) on violin and Gabby Noble (2013), who was singing in the Thames Youth Choir, one of the two choirs also performing in this concert. Both Aoife and Peter have written detailed reviews of their experiences which you can read in the April newsletter due out at the end of the week.